As one of the Main Line’s premier orthodontists, LynAnn Mastaj, D.M.D., has spent the past 30 years enhancing the form and function of her patients’ smiles. Now, with the creation of a new philanthropic campaign called Smiles for Charity, Dr. Mastaj will continue creating smiles in the community, only in a much different way. Starting this month, Dr. Mastaj is welcoming patients and other members of the community to stop by her Bryn Mawr office to donate a soccer ball, basketball or some other piece of new sports equipment. In turn, she will supply this equipment to organizations devoted to creating academic and enrichment opportunities for students from lower-income families. Every individual who donates a piece of sports gear will receive a complimentary mouth guard from Dr. Mastaj. As a young girl in Holyoke, Mass., Dr. Mastaj learned to excel in several sports, particularly tennis. In fact, she was an elite tennis player by the time she reached college, having won multiple championships in New England and also playing in the NCAA Tennis Championship tournament in Claremont, Calif. She traces much of her athletic success— and, in a way, the direction of her life—back to an experience she had while she was a student at Highland Elementary School. In fact, Dr. Mastaj believes the experience has continued to inform and enrich her life as an adult. An accomplished skier, hiker and mountain climber (not to mention an avid reader), she has scaled peaks around the world, ranging from Mount Elbert in the Rocky Mountains to Mount Kilimanjaro in Africa, and from Mount Fuji in Japan to Mount Kosciuszko in Australia. Now, Dr. Mastaj hopes Smiles for Char ity will help a new generation of students to reach their full potential. She says the primar y recipient of the donated sports equipmen t will be Horizons, a national program devoted to improving educational outcomes for students from low-income families. Other beneficiarie s may include After School Activities Partnerships in Philadelphia and The Sports Shed in Chicago, both of which are designed to offer en richment programs to underserved innercity students. Dr. Mastaj chose the Horizons program because its mission is to h elp participating students develop a lifelong love of learning and continue making academic gains throughout the year. Come summer, Ho rizons students will travel to host schools for a robust six-week academic enrichment program, according to Kathy Jacoby, executive dire ctor of Horizons at Episcopal Academy in Newtown Square. Although Horizons is primarily a summer-based program, participating stu- dents also visit the campuses of host schools several times during the school year for additional learning and enrich ment. On e of the things Jacoby likes most about the Horizons program is that it’s not only about learning but also about fun and selfdis c overy. She says many students in the program discover talents they never realized they had, ranging from art and music to athletics. 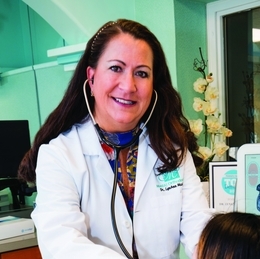 Dr. Mastaj is thrilled to make the connection with Horizons and network with a local program in need—and she expects Smiles for C harity to generate more of these connections in the future. Dr. Mastaj has long had a passion for helping others, particularly children. She sponsors a number of Radnor Wayne Little League teams, for example, though her efforts to assist people in need extend far beyond the Greater Philadelphia Area. When she traveled to Tanzania, Africa, to climb Mount Kilimanjaro, she did a medical service project in U ganda. There, she taught locals about the importance of proper oral hygiene, and she also organized fundraisers at home to provide much-n eeded footwear fo r Ugandan children. Published (and copyrighted) in Suburban Life Magazine, April 2018. 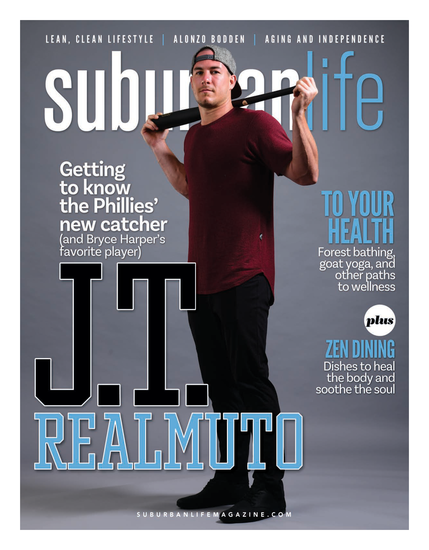 For more info on Suburban Life Magazine, click here.